I'm sorry I haven't been here to share our news. I think many of you have heard already, through various means. But anyway, he didn't get the job and it went down in a rather crappy way. I don't want to say too much about it, because we really do wish the person well who was hired. What you need to know is we didn't get it, but I'm thankful for your many prayers and good thoughts. And of course, he has his job to return to in the fall. So it's not dire. Just disappointing. 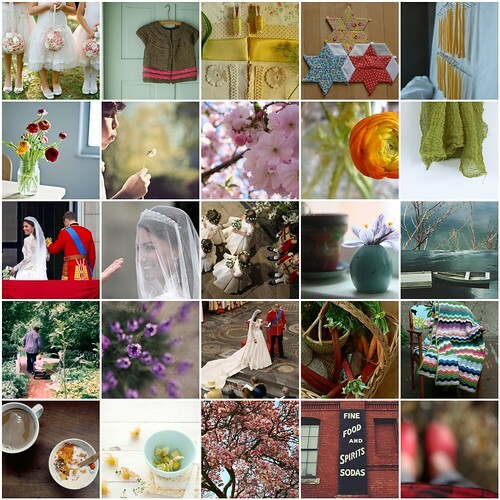 Here are some recent flickr faves that have been cheering me up a little (click on it to see photo credits and get a better view -- the right-hand ones are cut off). Along with good friends, both local and far away. Thank you one and all.